Choose Windstar Lines for your next charter bus trip to or from Manhattan, Kansas and enjoy our luxury charter bus rentals. In addition to experiencing one of a kind charter buses, we can also help you experience Manhattan. Located in the Flint Hills of Kansas, Manhattan is also home to Kansas State University. The town prides itself on its prairie ecosystem with attraction such as the Flint Hills Discovery Center, Sunset Zoo, Konza Prairie, and Tuttle Creek State Park. No matter if you want to arrange shuttle service to a local attraction or need sports team transportation for the Wildcats, Windstar Lines has a charter bus for you. Windstar Lines truly does have a motorcoach or bus rental for every type of group that wants to travel in or out of Manhattan, Kansas. 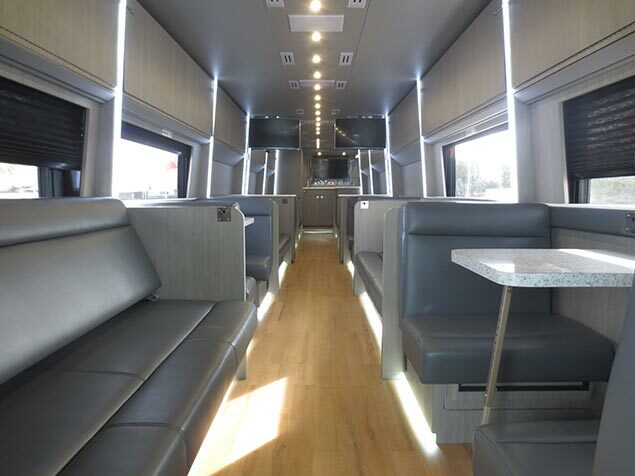 Our fleet ranges from minibuses all the way up to luxury motorcoaches, with many options in between. Each has its own unique features and amenities to accommodate groups of all sizes, interests, and budgets. When you travel with Windstar, you can rest assured that you will be safe. All of our motorcoach and bus rentals pass safety inspections, ensuring you will get to your destination safely and efficiently. Our drivers are also trained to operate all of our vehicles and undergo strict background checks, so you are safe in their care. Contact Windstar Lines for your next trip to or from Manhattan, Kansas. We will not only secure your reservation, but we will also help you plan your itinerary and the logistics of your outing to take one less thing off your plate. Call today for your free quote!